Karate began as a common fighting system known as "ti" (or "te") among the pechin class of the Ryukyuans. After trade relationships were established with the Ming dynasty of China by Chuzan King Satto in 1372, many forms of Chinese martial arts were introduced to the Ryukyu Islands by the visitors from China, particularly Fujian Province. A group of 36 Chinese families moved to Okinawa around 1392 for the purpose of cultural exchange and shared their knowledge of the Chinese martial arts. The political centralisation of Okinawa by King Shohashi in 1429 and the 'Policy of Banning Weapons,' enforced in Okinawa after the invasion of the Shimazu clan in 1609, are also factors that furthered the development of unarmed combat techniques in Okinawa. There were few formal styles of te, but rather many practitioners with their own methods. One surviving example is the Motobu-ryu school passed down from the Motobu family by Seikichi Uehara. Early styles of karate are often generalised as Shuri-te, Naha-te, and Tomari-te, named after the three cities from which they emerged. Each area and its teachers had particular kata, techniques, and principles that distinguished their local version of te from the others. Members of the Okinawan upper classes were sent to China regularly to study various political and practical disciplines. The incorporation of empty-handed Chinese wu shu into Okinawan martial arts occurred partly because of these exchanges. Traditional karate kata bear a strong resemblance to the forms found in Fujian martial arts such as Fujian White Crane, Five Ancestors, and Gangrou-quan (Hard Soft Fist; pronounced "Gojuken" in Japanese). Further influence came from Southeast AsiaÂ— particularly Sumatra, Java, and Melaka. Many Okinawan weapons such as the sai, tonfa, and nunchaku may have originated in and around Southeast Asia. Sakukawa Kanga (1782Â–1838) had studied pugilism and staff (bo) fighting in China (according to one legend, under the guidance of Kosokun, originator of kusanku kata). In 1806 he started teaching a fighting art in the city of Shuri that he called "Tudi Sakukawa," which meant "Sakukawa of China Hand." This was the first known recorded reference to the art of "Tudi,". Around the 1820s Sakukawa's most significant student Matsumura Sokon (1809Â–1899) taught a synthesis of te (Shuri-te and Tomari-te) and Shaolin styles. Matsumura's style would later become the Shorin-ryu style. Grandfather of Modern Karate, Matsumura, taught his art to Itosu Anko (1831Â–1915) among others. Itosu adapted two forms he had learned from Matsumara. These are kusanku and chiang nan. He created the ping'an forms ("heian" or "pinan" in Japanese) which are simplified kata for beginning students. In 1901 Itosu helped to get karate introduced into Okinawa's public schools. These forms were taught to children at the elementary school level. Itosu's influence in karate is broad. The forms he created are common across nearly all styles of karate. His students became some of the most well known karate masters, including Gichin Funakoshi, Kenwa Mabuni, and Choki Motobu. Itosu is sometimes referred to as "the Grandfather of Modern Karate." In 1881 Higaonna Kanryo returned from China after years of instruction with Ryu Ryu Ko and founded what would become Naha-te. One of his students was the founder of Goju-ryu, Chojun Miyagi. Chojun Miyagi taught such well-known karateka as Seko Higa (who also trained with Higaonna), Meitoku Yagi, Miyazato Ei'ichi, and Seikichi Toguchi. 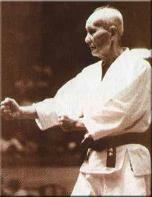 In addition to the three early ti styles of karate a fourth Okinawan influence is that of Kanbun Uechi (1877Â–1948). At the age of 20 he went to Fuzhou in Fujian Province, China, to escape Japanese military conscription. While there he studied under Shushiwa. He was a leading figure of Chinese Nanpa Shorin-ken at that time. He later developed his own style of Uechi-ryu karate based on the Sanchin, Seisan, and Sanseiryu kata that he had studied in China. Gichin Funakoshi, founder of Shotokan karate, is generally credited with having introduced and popularised karate on the main islands of Japan. Actually many Okinawans were actively teaching, and are thus equally responsible for the development of karate. Funakoshi was a student of both Asato Anko and Itosu Anko (who had worked to introduce karate to the Okinawa Prefectural School System in 1902). During this time period, prominent teachers who also influenced the spread of karate in Japan included Kenwa Mabuni, Chojun Miyagi, Choki Motobu, Kanken Toyama, and Kanbun Uechi. This was a turbulent period in history in the region. It includes Japan's annexation of the Okinawan island group in 1874, the First Sino-Japanese War (1894Â–1895), the Russo-Japanese War (1904Â–1905), the annexation of Korea, and the rise of Japanese expansionism (1905Â–1945). Japan was invading China at the time, and Funakoshi knew that the art of Tang/China hand would not be accepted; thus the change of the art's name to "way of the empty hand." The do suffix implies that karatedo is a path to self knowledge, not just a study of the technical aspects of fighting. Like most martial arts practiced in Japan, karate made its transition from -jutsu to -do around the beginning of the 20th century. The "do" in "karate-do" sets it apart from karate "jutsu", as aikido is distinguished from aikijutsu, judo from jujutsu, kendo from kenjutsu, iaido from iaijutsu and Taido from Taijutsu. Founder of Shotokan Karate, Gichin Funakoshi, changed the names of many kata and the name of the art itself (at least on mainland Japan), doing so to get karate accepted by the Japanese budo organisation Dai Nippon Butoku Kai. Funakoshi also gave Japanese names to many of the kata. The five pinan forms became known as heian, the three naihanchi forms became known as tekki, seisan as hangetsu, chinto as gankaku, wanshu as empi, and so on. These were mostly political changes, rather than changes to the content of the forms, although Funakoshi did introduce some such changes. Funakoshi had trained in two of the popular branches of Okinawan karate of the time, Shorin-ryu and Shorei-ryu. In Japan he was influenced by kendo, incorporating some ideas about distancing and timing into his style. He always referred to what he taught as simply karate, but in 1936 he built a dojo in Tokyo and the style he left behind is usually called Shotokan after this dojo. The modernisation and systemisation of karate in Japan also included the adoption of the white uniform that consisted of the kimono and the dogi or keikogiÂ—mostly called just karategiÂ—and colored belt ranks. Both of these innovations were originated and popularised by Jigoro Kano, the founder of judo and one of the men Funakoshi consulted in his efforts to modernise karate. In 1922, Hironori Ohtsuka attended the Tokyo Sports Festival, where he saw Funakoshi's karate. Ohtsuka was so impressed with this that he visited Funakoshi many times during his stay. Funakoshi was, in turn, impressed by Ohtsuka's enthusiasm and determination to understand karate, and agreed to teach him. In the following years, Ohtsuka set up a medical practice dealing with martial arts injuries. His prowess in martial arts led him to become the Chief Instructor of Shindo Yoshin-ryu jujutsu at the age of 30, and an assistant instructor in Funakoshi's dojo. By 1929, Ohtsuka was registered as a member of the Japan Martial Arts Federation. Okinawan karate at this time was only concerned with kata. Ohtsuka thought that the full spirit of budo, which concentrates on defence and attack, was missing, and that kata techniques did not work in realistic fighting situations. He experimented with other, more combative styles such as judo, kendo, and aikido. He blended the practical and useful elements of Okinawan karate with traditional Japanese martial arts techniques from jujitsu and kendo, which led to the birth of kumite, or free fighting, in karate. Ohtsuka thought that there was a need for this more dynamic type of karate to be taught, and he decided to leave Funakoshi to concentrate on developing his own style of karate: Wado-ryu. In 1934, Wado-ryu karate was officially recognised as an independent style of karate. This recognition meant a departure for Ohtsuka from his medical practice and the fulfilment of a life's ambitionÂ—to become a full-time martial artist. Ohtsuka's personalized style of Karate was officially registered in 1938 after he was awarded the rank of Renshi-go. He presented a demonstration of Wado-ryu karate for the Japan Martial Arts Federation. They were so impressed with his style and commitment that they acknowledged him as a high-ranking instructor. The next year the Japan Martial Arts Federation asked all the different styles to register their names; Ohtsuka registered the name Wado-Ryu. In 1944, Ohtsuka was appointed Japan's Chief Karate Instructor. Isshin-ryu is a style of Okinawan karate founded by Shimabuku Tatsuo, a student of Motobu Choki, and named by him on January 15, 1956. Isshin-ryu karate is largely a synthesis of Shorin-ryu karate, Goju-ryu karate, and Kobudo. The name means, literally, "one heart method." The style, while not very popular in Okinawa, spread to the United States via the Marines stationed on the island after they returned home, and has also spread to other countries. After the passing of Shimabuku, many variations of the system formed and exist to this day. A new form of karate called Kyokushin was developed in 1964 by Masutatsu Oyama (who was born a Korean, Choi Yeong-Eui). Kyokushin taught a curriculum that emphasized contact, physical toughness, and practical application of karate techniques to self-defense situations. Because of its emphasis on physical, full-force sparring, Kyokushin is now often called "full contact karate." Many other karate organisations based are descended from the Kyokushin curriculum. The World Union of Karate-do Organizations (WUKO) recognises these styles of karate in its kata list.